What is it about the green that turns rock steady, cool as you like golfers into gibbering wrecks? Maybe it’s the fact that this most unforgiving of elements on the course is the equivalent of centre stage. Suddenly you are the one in the spotlight, you are the one upon whom all eyes are trained. And, let’s face it, all your companions bar your playing partner will be praying that you foul up. There’s a word for losing your nerve on the putting green: the yips. The affliction can occur at any point on the surface, but it is most likely to grip the golfer when they are attempting to hole out. However, a lag putt, by definition, is not about holing out, it’s about placing the ball in as advantageous a position as possible from which to sink the ball. Nevertheless, this relatively long-distance challenge on the putting green can still present performance issues that need to be addressed. What’s the solution? Well, older heads in the clubhouse will adopt the no-nonsense, pull-yourself-together-lad approach; all very well when nursing a comforting double whisky in the safety of the members’ bar; but it’s a different story when the pressure is on and you are staring down at the ball. The most important thing to remember is to take your time. This, of course, applies to every golf shot, but it seems too many players feel the urge to rush their green shots – almost as if they just want to get the whole, horrible process over with. But it doesn’t have to be the sporting equivalent of pulling teeth. Take account of the conditions: you’ll be putting long so there’ll be plenty of opportunity for, say, a slick surface caused by rain to surprise you with the speed of the green; the same is true of a cross-wind that can shepherd the ball away from the intended spot near the hole. Read the green, too, to ascertain how its surface is going to influence the path of the ball. 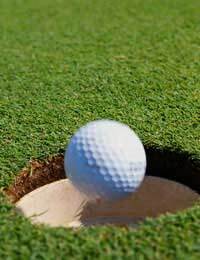 Once you feel confident in how you think the ball is going to roll, go through your usual preparation routine, keep limbs and eyes steady and concentrate, remembering that this is a shot for position that you are executing, not an heroic dash for the hole, so always err on the side of caution – it’s much better to two-putt than become overconfident and end up three- or even four-putting. Practice will play a major role in bringing a thoughtful approach to your lag putts, for example by setting up balls over a set number of distances from the hole in order that you sharpen your feel for the club and your eye in a variety of scenarios. Analyse your performance, too, to see whether you have tendency to pull up too short or hit too long. These sessions will be invaluable when the moment arrives for you to deliver in a match situation. The nerves are still likely to kick in, but at least you will have the comfort of knowing you are capable of meeting the challenge. Good execution may not result in the most dramatic shot of the day, but clam steady, percentage lag shots will mean that when it comes to adding up the scorecards, you are likely to be the one celebrating in the clubhouse.